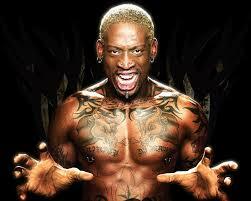 What did Dennis Rodman say to Kim Jong Un?? The the US State Department did not want to touch that picture. 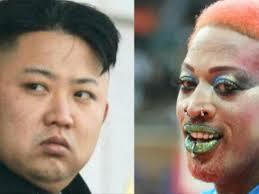 They did not want to know where it had been afterwards or what Rodman would have said to the new North Korean leader as he is taking his first fat baby steps as an autocrat. The State Department made it quite clear in official channels to Pyongyang that the Worm was not a diplomatic Ping-Pong-player-ploy-to-China moment to melt the ice between North Korea and the US like happened in the 1970s that paved the way for Nixon to come to China to rock the world and roll with Papa-Oooh-Mao-Mao Zedong. 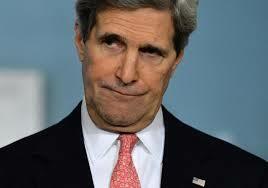 Secretary of State John F. Kerry. Rodman was the wrong man to play even Forest Gump in a fictional attempt to ping pong Pyongyang for a new US-North Korea easing of tensions. Perhaps Rodman was there to help promote Donald Trump’s new reality show retread of The Apprentice – because soon as Rodman came back to the US of A, the Donald’s A team of bigger than life – and smaller on subtle, over the top – Apprentice Celebrity All Stars, including the Worm, launched Episode One of the much hyped and Donald Trumped-up reality show. 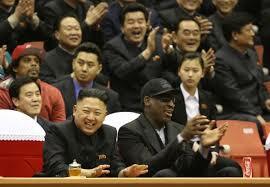 After the error errant of dippy cartoon diplomacy “Wormed” his way home, Little Kim did the “Un” thinkable. The worm turned and Dennis was not to blame but a new UN regimen of sanctions passed a short time later punishing the North Korean regime for test-firing a sizable nuclear weapon in an underground test. The Korean War which had been put on hold since an armistice was signed in 1953 by North Korea with the Republic of South Korea and US forces dominating the UN military “police action” was now suspended by Kim Jong Un-equivocally. Before now, the UN sanctions did more to hurt millions of marginally employed, hungry and even starving North Koreans. The new sanctions one cut to the marrow of the illicit North Korean commie-mafia’s pipeline to smuggle money in and out of the Soviet-style hermit anachronistic kingdom via diplomatic immune sources, literally by the North Korean diplomatic mule carrying suitcases full of cash, luxury goods to the Young-Un. His father, Kim John Il would turn in his grave if the $300-dollar-bottle Hennessey cognac were now blocked from entry. Then, add to the ghost of Kim Jong “Il”-sult to injury, North Korea’s last political friend in the world, The People’s Republic of China, the same regime that had in 1950 sent and saw mostly consumed a million Red Chinese soldiers. The regime that saved grandfather Kim Il Sung’s “Il”-conceived invasion of South Korea, actually signed the UN Security Council’s resolution of new sanctions. That is how fed up Beijing is with Pyongyang’s No-Dong Scud missile prongs, test nuke bombing and Taepodonging ICBM missile threats directed recently by Kim Jong Un-abashedly at the United States. 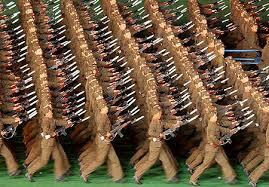 The North Korean Army on perpetual parade. With the end of the armistice coming, they might have to fight. This is a significant escalation in an old ruse of North Korean leaders, especially since the fall of their Soviet Union patron at the end of the Cold War in the early 1990s. Each Kim has played the “I’ll jump and take the Korean Peninsula with me!” bluff. This attempt to wave missile-tipped Armageddon, chased with North Korean television images of serried ranks of goose stepping soldiers, rows of TV prop missiles, North Korean army units, sometimes with halos around their helmeted noggins charging hither and thither, usually is done to blackmail concession from the US and China that keep the tenuous autocratic regime afloat. Usually when one Kim dies from Jong or Sung-“Il”ness, there is a period a few years before and after the power shift to a new heir where the heir apparent has to create military incidents on the DMZ with South Korea to show the new leader has the ballistic balls. It also happens that after the new Kim “Chee” of power is crowned with incessant military parades along sterile Pyongyang boulevards and skyline with grotesque heroic statues that some incident taking it too the brink of a suicidal jump into full-scale war is threatened. Yet never has a new Kim entertained the Un-thinkable rejection of what has been a relatively peaceful and stabilized six decades of a North Korean-UN armistice. 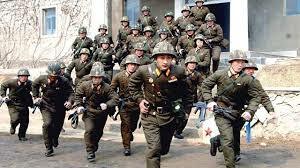 The usual Pyongyang threat to open the war again has hitherto not happened until now. Moreover, Kim Jong Un threatens UN and US in particular with test firing his Taepodong 2 missile at US territory adding that soon he will top it with a nuclear warhead in a preemptive nuclear attack! Then the jig, the jive and this Jerk-brinksmanship ploy will be up and Kim Jong Un-redeemable, after which we will see the beginning of the implosion of the North Korean regime. This article is posted on the day South Korean and US forces practice the long planned military maneuvers that North Korea has been aware would happen for over a month. Little kid Kim threatens to leave the 60-year armistice agreement if the drills go forward. A number of my readers in South Korea are writing in about it. The North Koreans! Here they come for their closeup. But how good are they in close-quarter combat? I live in South Korea outside of Seoul, about 20 miles or so from the North Korean border. I wanted to see if you think that North Korea and South Korea will end up in another Korean War. My wife, who happens to be Korean, thinks nothing will happen and that she has been living here all her life. I tend to disagree. This new president has more guts than the last and already stated that she would attack the North Korean leadership if North Korea decided to attack again like the shelling 2 years ago. Thank you and I hope to hear from you. Park’s will “park” a missile right down the mouth of the young Un. Decapitation of the North Korean regime will hurt it the most..
Now, when my dad learned his fisticuff skills in Depression Era Watts, Los Angeles, gangs settled their disputes with their fists. The escalation to knives, hand guns and now semi-automatic rifles makes his “hit the bully mouth first” a simplistic and anachronistic solution. It is a whole other and unpredictable matter when rather than punching a loudmouth you blow off the head and hope the body of the regime will then fall. One way or another, this bluff of the North Koreans is coming to a head this year. Whether it leads to a resumption of the Korean War bloodbath or cuts the head off the dragon leaving the North Korean regime dying with a lifeless nerve twitching allowing for a reunification ot the Koreas Kim Jong Un’s regime has escalated its bluff game to the limits of suspended belief. 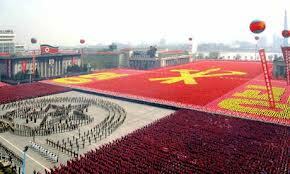 No, this is not a new Mel Brooks movie musical spoof, like the Producers: "Spring Time, for Kim Jong, in Geermaneee!" This is one of many subjects addressed in detail in Predictions for 2013, which is scheduled for release around Easter 2013. Return to the main Hogueprophecy article page on Papal Prophecies. 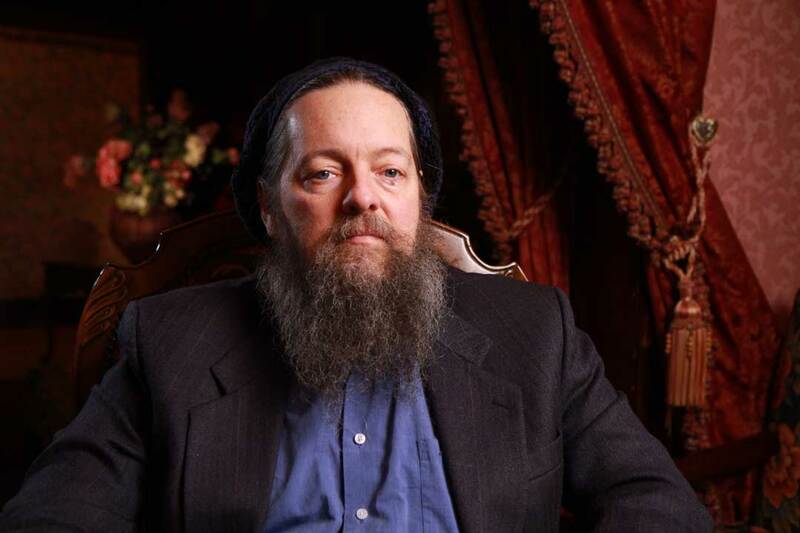 John Hogue in a still from Vision TV's new series, "I Prophesy". for someone who’s into the mystic arts, meditation, spirituality, prophecy, and oneness… you are very immature. i see many jokes on your site that poke fun about serious issues. its become more of a propaganda/comedy site, in my opinion. jokes about nuclear armed countries and their leaders. what if he read this? you should learn from chaplins ‘great dictator’ mistake. he cried when he heard about the atrocities of the nazis, after he made a movie humiliating hitler in front of the world. youre no chaplin, sir, but everyone, both positive and negative, affect the world. i hope this reminds you to be a bit wiser, and maybe a bit less clever in your attempts at humor, which can downright racist at times. I’m having a powerful vision about you. This is very serious. There’s a message from beyond and I can’t help it, I must wear a little bowler hat, twitch my nose and walk with my big feet sideways. I think I am being demonically possessed by the ghost of Charlie Chaplin — or is it Hilter? I don’t know, they both have the same mustache and were born exactly on the same day and year. Anyway, Adolf Chaplin has sent me a message from the Beyond, Dmesh. And since you are a very serious person you should take this very “very” seriously. I don’t know. This spirit message sounds like good advice. Brand is fiber and it could loosen you up, help you “let go” of all the things you carry around. I prefer brain washing myself. I like to keep my brain clean of all the crap we are trained to dump in it. Meditation helps me keep my brain washed clean. Cleanliness is next to godliness. I would have suggested meditation and I think that’s a better option for you. If you like, I can send you links and information to the meditations I use. It might help you find the humor even in serious prophetic news. And anyway, seriousness is a “dis-ease”. Even tragedy has its funny side. Since I have made this comical turn, I have had a multitude of people come visit my web site. Humor can be a bridge. It can help people look deeper into matters. You should try it. theres a group of people who laugh and joke about everything, theyre called clowns. youre joking about demonic possession and racism? i have a sense of humor, about humorous subject matter. racism, nuclear war, and demonic possession just arent very funny to me. poop jokes from a racist prophet arent funny either. you think that more hits equals better subject matter? are you more concerned with being a prophet, or making profit, bah-zing. One of the best jokes about my work is when people think there’s a lot of money made doing what I do. It cracks me up. And yes, people tend to read you and your hits do increase if you punctuate your sentences and put apostrophes in “aren’t”. if that were true then these pop stars are the best musicians ever, more sales than beethoven, bach and mozart combined. Hey everybody, isn’t Dmesh a match made in heaven for Tard the Grumpy Cat? Beethoven’s paintings have him scowling. Bach looks so formal. But there’s hope. Dmesh likes Mozart. He knew how to party. Actually, if we’re going to talk about “SERIOUS” music, Gumpy, did you know that Wagner made more money than those three put together and about a hundred others put together. He wasn’t a pop artist. Even though Puccini, when he first attended a performance of Wagner’s Parsifal, wrote, “Compared to Wagner, we’re all a bunch of guitar pickers.” And Wagner loved Beethoven as I do. I also am open minded and open-hearted enough to enjoy any musical style as long as it has a certain excellence and genius, whether it’s Alanis Mortisette, the Beach Boys, the Beatles, Guns and Roses, Van Morrison or Marylin Manson (I love “Rock and Roll is Better than Dead!”) And Guns and Roses’ “November Rain”. I love people as far removed from Nirvana as gloomy Dmesh here. And since we are speaking of Nirvana even a greasy-haired suicidal Peter Pans like Kurt Cobain can still create songs like Heart Shaped Box and Team Spirit. i was a fan of your work for a long time, but now i see that you have sold out. how much was your integrity worth. your racist propaganda and poop jokes are too much to listen to. im done with this site. i’ll still read nostradamus, a much better prophet by far, but not your drivel. Fortress of solitude. I belong to the Edgar Cayce society and Unknown Country.com Amateur Radio is vital in this time frame. ARRL.org. You are a breath of fresh air. Keep the news coming. Thank You!! !